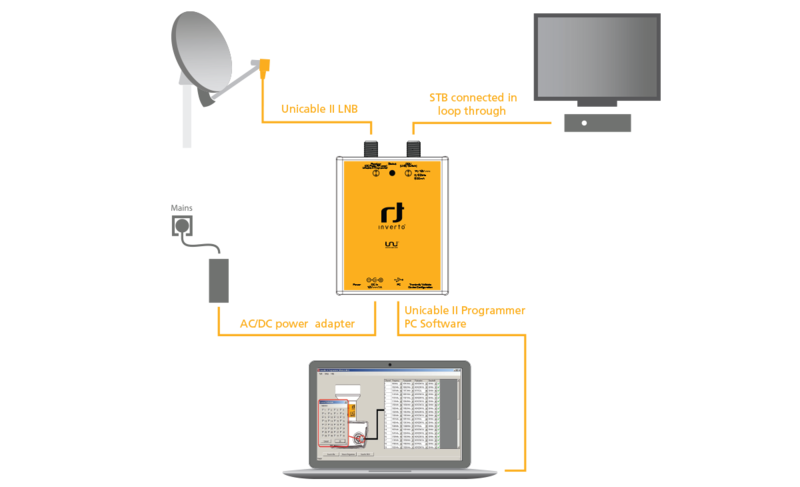 Inverto’s Unicable II™ Programmer is an essential installation tool helping to configure and diagnose any Unicable II™ LNB or Multiswitch using a PC. The Inverto’s Unicable II™ Programmer software tool for PC provides an easy to use and intuitive graphic user interface allowing the installer to modify the default parameters of the installed Unicable II™ LNB or Multiswitch including for example, the operating mode (Static or Dynamic), the RF/IF frequency mapping grid for Static mode, the IF frequencies of the User Bands, the output power level and the protocols used over each User Band (EN50494/EN50607). The PC software tool allows to carry out diagnostic tests on the connected LNB or Multiswitch, retrieve diagnostic logs and identify potential installation health issues. The programmer provides several options for updating the firmware or the configuration file of the connected LNB or Multiswitch through the PC. It also features an internal memory that can store a configuration file prepared on the PC and transmit it later to a connected LNB or Multiswitch in the field by pressing a dedicated button releasing the installer from carrying his laptop to the field. The Programmer device can be integrated into an existing installation, power the LNB or Multiswitch unit using the supplied AC/DC power adapter, and allow a parallel connection to a PC over USB for monitoring and configuration. The Programmer is supplied with an external AC/DC adapter and a USB cable. Input voltage: 100 VAC ~ 240VAC, 50/60 Hz, 0.8 A max.